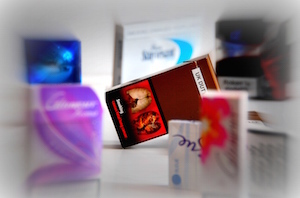 Legislation requiring the cover up of tobacco products in all shops across the UK - informed by University of Stirling research – takes effect today (Monday 6 April). The key public health measure is intended to reduce smoking, and in particular, to cut the number of young people taking up the habit. Scottish supermarkets have already had to cover up their displays for two years (three years in England, Wales and Northern Ireland), but from today all UK shops selling tobacco must do likewise, or put tobacco products out of sight. Martine Stead, Deputy Director at the Institute for Social Marketing based at the University of Stirling, said: “It’s well established that exposure to tobacco advertising encourages people to take up, and to continue, smoking. “When advertising was banned in the UK in 2003, one of the few forms of marketing left to the tobacco industry was the wall of attractive packs behind the counter in the corner shop. Research in several countries – Australia, New Zealand, the USA, the UK – has shown that exposure to these tobacco displays at the till points increases children’s and young people’s awareness of tobacco brands; makes them think that tobacco is a normal and easy thing to purchase; and makes them more likely to intend to smoke in the future. Seeing tobacco gantries also stimulates cravings and purchase among existing smokers and may make it harder for them to stop. “The intention of this banning legislation is that future generations of young people will grow up with less exposure to tobacco marketing and reduce the number of young people who take up smoking in the future”, explained Martine. Vital research was conducted by Stirling’s Institute for Social Marketing involving over a thousand 11-16 year olds across the UK. The Cancer Research UK-funded study showed that, among young people who had never smoked, noticing tobacco displays at point of sale increased the likelihood of them being susceptible to smoke in the future by 77%. Even taking into account other influences known to increase the numbers of young people starting smoking – such as economic status, family and peer smoking – tobacco displays in shops had a significant effect. When the 2009 Health Act(England and Wales) legislation was discussed in the House of Commons and House of Lords, the Stirling research was widely mentioned as one of the key pieces of information which influenced the vote in favour of banning displays. Today’s milestone comes after MPs voted last month to introduce standardised or ‘plain’ packaging of cigarettes across the UK, while last year it became a criminal offence to smoke in cars in England when children are passengers, both measures designed to further protect children from the effects of smoking. The original study by the Institute of Social Marketing, published by the University of Stirling is available at http://bit.ly/1DnzvuM.